New, innovative manure acidification technology has arrived at Blunk in Rendswühren. The test phase is now over, and the slurry acidification system is ready to be used. The Blunk team has been a partner for the technical part of Baltic Slurry Acidification from the beginning. Blunk has investigated the practical aspects of the acidification process and possibilities for optimizing the technology. The improved equipment for tractors and manure tanks has been carefully tested. After an extensive development and testing phase, Blunk now has a sophisticated, efficient concept for the in-field acidification of manure. The Blunk team was looking forward to the arrival of the new technology at the depot in Rendswühren and the question on everyone’s mind was “will this all fit together and work the way we had imagined?” And finally the time had come: the new parts and appliances arrived and stood on the courtyard, shiny and new. After a first inspection, the workshop team pulled out the wrenches and began to set up the electronics on the tractor. Then it was time to wait a few days. The developer of the process, Morten Toft, came personally with his team from Denmark to upgrade to the special acidification process. Together with the Blunk team on site, the Danish team equipped the tug and the Kaweco slurry tanker with the tow hose and made them ready for operation. Among other things, add-on parts to the slurry tanker, such as the special dosing unit and a mixer, and finally the acid tank on the front of the tractor were carefully assembled, adapted and connected. The most visible attachment is the additional tank designed especially for this purpose. Finally, everything was ready for the first use. Before Blunk’s Danish partners left, an intensive instruction in the technology was given. 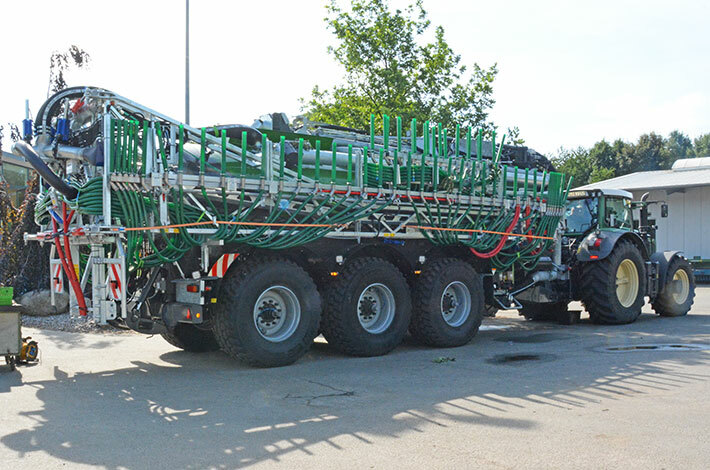 Blunk’s team of machine operators, who are specially trained for this method of manure spreading, also benefited from the 15 years of experience of the Danish experts.